Sorry, I Didn’t Mean To Wake You! The more the Creator awakens us, the bigger His expectations. The Creator woke several million people who at this time study The Zohar and He waits for their correct, conscious, and voluntary reaction that would manifest their readiness to “wake up.” “Awakening from below” (Itaruta de-Letata) has to become equal with the “awakening from Above” (Itaruta de-Leila). When these two processes coincide, the Light of the Creator fills us. By slowing us down, He wants us to replace His awakening by our own voluntary effort to wake up. Otherwise everything happens “at His expense” rather than through our own effort. What good does that do? This way, our spiritual vessel doesn’t get ready for the Light. That’s why we feel like we reject spirituality. However, was our previous desire really ours or were we just granted the chance to go through such circumstances from Above? Now that you’re convinced that you don’t want spirituality – that is the real you, your desire to receive pleasure to which you can add the same sense of awakening that you first experienced. The Creator woke us up, we turned His awakening into “our own”; we acknowledged and made it available to other people. Then together with others we make attempts to attract the Upper Light. We use this situation as an amplifier: Our request grows in direct proportion to the number of people to whom we managed to transfer this knowledge by working against our own egoism. We receive “620 times” more in return; this is how many times stronger our own advancement toward the next degree becomes. Laitman.com Post: The Rules Of "The Game"
A question I received: During The Zohar lessons I always find myself at war with myself. What can I do to maintain the right intention? My Answer: That is a natural state for beginners. Try to use the time at the lesson to realize the purpose of your suffering. Who is it in you that suffers? It is your body, your egoistic desire that resists. You have a body, the ego, and the point in the heart which aspires to the Creator. Are you examining your state from within the ego or the point in the heart? If you are one with the point in the heart, then The Zohar shines to you, but this Light is opposite to your ego. It feels adverse to you, like a person that speaks out against you. Imagine sitting in front of your wife as she criticizes you, saying that something is wrong with you, and you listen and agree with her criticism, realizing that you do need to correct yourself. Your uncorrected ego resists and doesn’t want to listen, but you tell yourself: "It’s not me who doesn’t want to listen, but the ego that the Creator deliberately created within me. I, however, want to listen and to love her, because she is pointing out my real shortcomings that need correcting." Picture this scene to yourself in the smallest detail until you realize that you really do need to sit and try to cling to every word of The Zohar. You don’t like what you hear? That’s wonderful! You’re not interested in revealing this? Absolutely! The Zohar is opening your eyes to the whole truth, thereby infuriating you and that’s great. That is precisely what it’s supposed to do. That is how the Light influences you, by showing you how uncorrected you are. Precisely then should you rejoice and desire to cling to it. Now you have two points: the uncorrected Malchut and the spark which you have to connect to the Light. Go with the Light against your uncorrected Malchut, and then The Zohar will cease to irritate you. You will begin to work on yourself with what it awakens within you. Practice this at home with your wife for a bit, and then the work with The Zohar won’t seem so hard. The Croatian group, in collaboration with a major bookstore in Zagreb, presented the new book in Croatian (the translation of Kabbalah Revealed) and held a lecture on Kabbalah to the representatives of mass media. Thanks to our friends in Croatia! A person wanders in darkness not knowing what to do and desiring to ascend spiritually, to move from reception to bestowal. Until the moment of the first revelation – crossing the Machsom and encountering the Light – he has no example of how it happens. After it occurs, his own experience allows him to sense a new reality rather than trust someone else’s words. Yet until a person reveals the right spiritual desire (Kli) within himself and contacts the Light directly, it is impossible to prove anything to him. The wisdom from Kabbalists won’t affect a person that does not possess spiritual experience on his own. He starts from scratch. He deals with something that is above his nature and exists beyond the boundaries of death. While we are still alive, we have to elevate to a level of existence that is above death, called “the world to come.” Nothing can replace this attainment or prove this to us. To reach this revelation, we need to correct our desires and obtain spiritual “sight,” the Light of Hochma which clothes itself in our desire to receive. This is the only proof we can get. Right now, the only “justification” for learning Kabbalah is the belief that the Surrounding Light corrects us. We hope that we have found a remedy that is able to disclose the Light and change us. 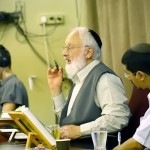 It works like a miraculous force (Segula) that is concentrated in authentic Kabbalah books. These books serve as a means to reach an exalted state that we are unable to approach on our own, and attract the influence of Light upon ourselves from there. It is written: “I created the evil inclination and the Torah to correct it, because the Light in it Reforms.” Our entire learning process is about the realization of this sentence. We strive to change ourselves and start sensing a new life, a new dimension within our corrected desires. A question I received: I have already participated in virtual Kabbalah Congresses and felt the unity. Why should I leave the comfort of my home and my living room couch, and why should I make efforts to personally attend the World Zohar Convention that will be held in New York at the beginning of May? My Answer: It’s impossible to unite with others without “getting up from the couch.” We don’t live in the virtual world, but the material world. Therefore, a person who attends our physical meetings understands how necessary it is in order to advance. A person who has never left his computer screen is unable to imagine what it means to unite with other people. There is a rule in the science of Kabbalah: a spiritual root has to touch its material branch. Therefore, we have to implement the connection among us, both in the virtual form and the material form. This is required by our world. Therefore, if a person never attends one of the Congresses, he is not really participating. It only seems to him that he is together with everyone while he is sitting by his computer screen, but in reality, this is a delusion. Once a week we hold a virtual assembly of friends, and once every half a year we hold a “live” assembly where we meet together with people at one of the continents. People definitely have to participate in these Conventions. A person cannot advance without participating in a Congress and without receiving an impression (Reshimo) from it. The Convention is the place where his unity with others transpires, and this connection remains. It’s as if he plugs into the electrical outlet and stays plugged in. We did not make this up ourselves. Our great teachers practiced this for centuries, and if we want to attain the same thing they did, we have to follow their example. The nation of Israel originated in Babylon, where Abraham revealed nature’s Upper Force and then started to disseminate this knowledge about the Creator, the goal of creation, and the purpose of man and society. It was all done to enable us to ascend above our world, rather than be like all the animals that merely live and die, over and over again. This group went through a lengthy path and grew until it came to be called “the nation of Israel.” This is not a regular nation like the other nations of the world that unite in a natural manner. “The nation of Israel” can be joined by every person who aspires to unity in order to reveal the Creator – the force of bestowal and love. Therefore, this group (or nation) can be in one of two states: exile, which is when they want to unite, but they haven’t yet attained it; and redemption, which is when they attain unity. They then attain the state of being as one man with one heart through a mutual guarantee (Arvut). Thus, they reveal the Creator within themselves (in Hebrew the Creator is called Boreh, which comes from the words Bo – come and Reh – reveal). They proceed to ascend up the ladder, reaching greater and greater unity and attaining greater bestowal until reaching the Final Correction of the ego, transforming it to love for the neighbor. This is the state of adhesion, Dvekut. Eventually, all of humanity will have to join this group and join the Creator together with them. Today we have already gone through four exiles and three redemptions. We are now standing before the final redemption, meaning the final, full revelation of the Creator to every single person in the world. Rambam (Maimonides): "Abraham’s Revelation of the Creator"
As Baal HaSulam states, the whole world is one family. Hence the on-line system that we want to create must work on each person like a Kabbalistic group that helps him build new connections and new attitudes about himself, his friends, and the world at large. We would like to lay the foundation of this structure on the Internet so that we all connect in one system regardless of user language, location, or any other factors whatsoever. It should be an independent self-driven structure that helps all of us advance spiritually. In other words, we need to create an artificial system of spiritual connections among us, which is identical to the union that exists between our souls. Kabbalists advise us to join a group and begin to build relationships with it as if you were already in spirituality. The revelation of the Creator is the revelation of the qualities of love and bestowal in a person. With the help of the Light or the Force that created me, I can rise to a new degree of development. The desire to bestow is such a “pure” desire, that it can be clothed with the intention to bestow. It does not attract Light; it annuls itself before the Upper. The connection to the Creator is measured not by my closeness to Him but by the extent of my demand for an ascent, which comes from the depth of my egoism.